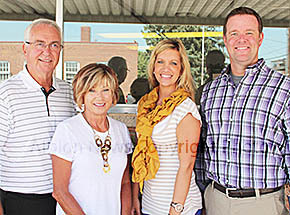 Ralph and Debbie Schmadeke this week announced that Bryce Spann of Lincoln, a native of Ainsworth, NE, has purchased their longtime Albion business, Schmadeke Inc. Insurance and Real Estate. The sale will be effective Sept. 1, 2015. Ralph and Debbie Schmadeke and Nikki Stephens will remain with the company under new ownership. Bryce Spann made initial contact with Ralph and Debbie more than three years ago, and is now moving his family here to own and manage the independent insurance and real estate agency that was founded in 1910. Details in the Aug. 19 Albion News Print and E-Editions.